On Sundays, especially in the winter, I like to put a little extra effort into dinner. This often means I'll roast a chicken or some beef, or occasionally make a stew. 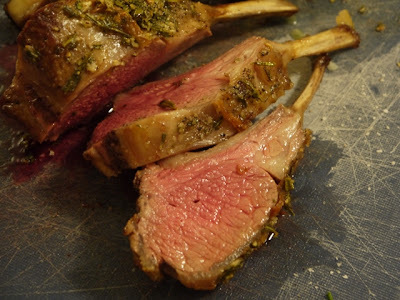 I've been wanting to make lamb for a while but it is generally so large and expensive when I see it in stores. Finally I found a nice little rack of lamb for about seventeen dollars. It was frozen, but only weighed 500g so it took no time at all to thaw. I found this recipe on the awesome Epicurious for rack of lamb for two. I love it when the portion size is just what I need - no math! I heated some oil in my cast iron pan. Then browned the lamb for a few minutes. Once it was nice and brown I removed it from the pan, drained the oil and browned the potatoes and shallots for a few minutes. I had too many potatoes, so they didn't brown as much as I would have liked. The shallots, however, browned more than enough. ... and popped the whole thing in the oven. The recipe called for roasted tomatoes as well, but we are not fans of that nonsense. I roasted the lamb and potatoes for 20 minutes and then pulled out the lamb for testing. The thermometer said 140 exactly so I let it rest and tossed the potatoes back in to try to get them more browned. I steamed some yellow beans while the lamb rested. I wasn't totally sure what to expect, but when I sliced the lamb, I was over the moon! I served it up with yellow beans and lots of potatoes. Cooking the lamb on top of the potatoes gave them such incredible flavour. They may be the best potatoes I've ever had. I barely missed the crispy exterior. This dinner was amazing. Especially considering the amount of effort it took. It is perfect for a Sunday dinner or special occasion, but easy and quick enough for a weeknight. If only lamb was on sale all the time!